U.S. Secretary of State John Kerry waves as he boards his plane at Dushanbe Airport, Nov. 3, 2015. RBTH presents a selection of views from leading Russian media on international events, featuring reports on John Kerry’s recent trip to Central Asia, new theories emerging around the plane crash in Egypt and Belarusian President Lukashenko’s delicate balancing act. The trip of U.S. Secretary of State John Kerry to the countries of Central Asia is the first ever visit of the chief of U.S. diplomacy, during which he will tour five post-Soviet countries, the pro-government news outlet Vzglyad reports. Kerry's tour began with Kyrgyzstan. After a meeting with the Kyrgyz president, Kerry said that the countries of the Central Asian region should not be faced with a choice of one partner to cooperate with – Russia, the U.S., China or "other blocs," and in Kazakhstan the secretary remarked that friendship with one country should not preclude working with another. Currently, the United States would like to conclude with Kyrgyzstan an agreement on military cooperation. 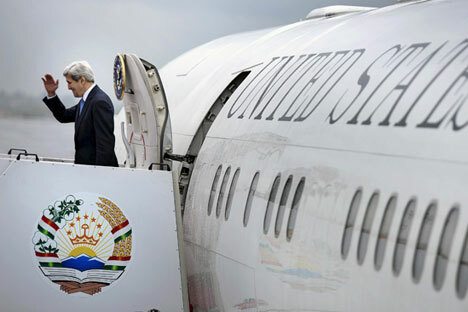 After Bishkek, Kerry arrived in Uzbekistan and Kazakhstan. On November 3 he will visit Tajikistan and Turkmenistan. The common ground with all countries has been attention to the issue of the spread of terrorist threats. Andrei Kazantsev, director of the Analytical Center of the Institute for International Studies at the Moscow State Institute of International Relations, highlighted the three main objectives of the tour – Afghanistan, Russia and China. Kazantsev sees Afghanistan as being the number one issue. "Most of the U.S. forces were withdrawn from the country (Afghanistan – RBTH), the situation there is being radically destabilized and Washington needs to establish additional cooperation with the countries of the region," Kazantsev notes. Secondly, Kazantsev believes that Kerry wanted to see how strong Russia’s position had become in the region. "After the Ukrainian crisis, Moscow's influence in Central Asia has increased dramatically," Kazantsev says. "There is a gradual expansion of the EAEC (Eurasian Economic Community – RBTH),” and cited the fact that Kyrgyzstan had expelled an American military base as another matter of U.S. interest. He also stated that many experts believe that the role of Central Asia could be of fundamental importance for the next American president. Finally, Kazantsev says, the Secretary of State's visit is connected with the growing role of China in the region. New details have emerged in the case over the crash of Airbus A321, the online newspaper Gazeta.ru reports. According to sources, "elements that do not belong to the plane" were found among the debris. They were sent for examination. A little later, an Interfax source said that investigators heard "sounds uncharacteristic for a flight" during the decoding of "black boxes." The source also said that the last communication with the controllers was four minutes before the plane disappeared from radar screens and the crew did not report any malfunction. "It seems that at the beginning of the catastrophic situation the crew were completely unable to function," says Alexander Smirnov, deputy director for flight operations at Kogalymavia. Such a catastrophic situation could be caused by an explosion on board the aircraft or sudden depressurization. U.S. media reported citing a source in the Pentagon that its satellites spotted a flash during the final minutes of the airliner's flight over the Sinai Peninsula. "The data are still being analyzed in order to determine what exactly caused the flash,” the newspaper reports. “One reason could be a bomb, but it might be also an explosion in a fuel tank or an engine as a result of mechanical failure." Belarus is developing a new military doctrine focused on national interests centrist newspaper Nezavisimaya Gazeta reports. The draft of the new doctrine should be considered by the Security Council by the end of the year. This was announced last week by Belarusian president Alexander Lukashenko. "For us it is very important to maintain the balance of relations with Moscow and Kiev, developed at political and diplomatic level,” said Lukashenko. “Whatever the situation, we should not be drawn into a confrontation between them." According to the president, the main threats of our time are the desire of the United States and its allies to consolidate their leading role in the modern world order, the unprecedented deterioration of relations between Russia and the West and the influence on geopolitical processes by various destructive non-state actors. According to military expert Alexander Alesin, Lukashenko sees a threat from Russia, which is indicated by a change in its position on the deployment of a Russian air base in Belarus. "In 2013, Lukashenko agreed to a base in Belarus, but now, after the Crimea, he dug his heels in," Alesin says. According to the newspaper experts believe that another reason for Lukashenko’s reluctance to have a Russian air base in Belarus is the desire not to disrupt the fragile dialogue between Minsk and Brussels. Last week, the EU approved its decision to suspend sanctions against Belarus for four months.